What do your medical records say about you? Who sees them? How are they shared? Are they open to misuse? From typing errors to lax security even the smallest slip-up could result in the inadvertent abuse of your records. And the government’s new scheme to digitalise medical records is causing widespread concern. Should you be worried? The NHS is launching a controversial new scheme this year, intending to upload its entire patient database to a central electronic system called ‘Spine’. Patients will be offered the chance to opt-out of the database, although ministers are hoping that to put an end to prehistoric paper systems. 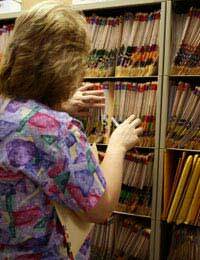 The new system will make your medical records available to thousands of medical staff. Why the controversy? Well, the Information Commissioner last year stated that more than 300 journalists had obtained private information from government records – due to poor security and insignificant penalties. Campaigners are concerned that the government will not put enough security in place, and the privacy of around 50 million patients could be undermined. They’re also concerned about errors in patient records, after a local councillor discovered that she had been labelled an alcoholic – a simple typing mistake. Who can View my Medical Records? The main benefit of the new NHS database is that it will enable paramedics and hospital staff to access your medical information in an emergency. This is thought to be especially beneficial for the elderly, who may not have close family on-hand. Other people can view your records, too. Insurers can view your medical records if you’re applying for Critical Illness insurance – if they contain something you haven’t disclosed, your policy could be void. The police can apply for a court order to get access to your medical records if they have due cause to do so. If information on your medical records is believed to be important to the general public’s safety, then a court will give permission. You are applying for someone else’s records (unless you have a letter of consent). Your medical records are held at your GP’s surgery, which will usually allow you to read them if you ask politely. If there is a problem then you can make an official request in writing, which your surgery or hospital is obliged to answer within 40 days. And if there is a further problem with this, you can complain – first to the NHS (ask for their complaint leaflet), then to the Health Ombudsman, and finally to the Information Commissioner. Permit your records to be uploaded (there is no need to write). Object to the uploading of your records. Place restrictions on the people who are able to view them (i.e. GPs and nurses). Place restrictions on the information which is uploaded (i.e. you can ask for details such as abortion or HIV tests to be removed). Your medical records are Sensitive Data and the GDPR Data Protection Act doesn't allow sharing without your specific consent. Also, the data shared should be only the absolute minimum needed. If someone has gained access to your medical record without your consent you should contact the Information Commissioner's Office using their complaint form. It would be useful to have as much information as possible to substantiate your complaint. Write down exactly what was said and by whom and when. You can apply under the Freedom of Information Act to see documents which are written about you. So, if Social Services had Medicalinformation which you feel they shouldn't, you could apply to a them under the FOI act under Subject Access rules to see anything which they have written about you. Was that medical info supplied by your GP or hospital etc. You can find out under the FOI Act. It can be a lengthy process. Have a look on the ICO website, give them a call, they take ages to answer But their advisors are very knowledgeable. Keep copies of letters, emails etc. and note down conversations in a diary. If you are well prepared and have as much information as you can, you'll definitely be able to find out what's happened. I recently had an ENT appointment as I am sufferingfrom tinnitus, I am now being inundated with advertisements for Tinnitus, someone has told these companies of my problem, can they do this? Have tried to change surgeries only to find that the new place appears to have "shredded" my application (according to the receptionist there; she then advised me to apply again whch I will if onlyto see if this happens again) and my current GP has wiped the details of previous appointments, access records audit trail and medication from my on-line account.I would sincerely like to know why. I plan to go for a Subject Access Request to see if this sheds any light on what is happening.I was under the impression fron the NHS website, that GPs cannot ask why you are changing surgeries and cannot block the move either. my med. docs have been shared between hospitals without my consent and state that I have calcification in my right lung possibly as a consequenceof talcing, but are only guessing. This is wrong on all levels. I have never been told that I have calcification. Why would they discuss it amongst themselves without the patient being told or consented.They should have asked if I would consent to sharing especially to a hospital where i would never go for treatment. What if the calcification is cancerous. All my father's side die of cancer. This is medical negligence not informing me and breach of confidentiality and betrayal of trust. I will never go to a hospital again. Hi can my medical records after a mental illness stay be shown to child protection without me being informed or without my consent? I got section by a racist corrupt transport police officer for no valid health rasons, the police stated she was doing it because I wasnt allowed to mention one of the people involved in the harassment I was trying to report to the police.The detention was illegal, corrupt,vindictive and done on purpose, I was assaulted in a room with 4 police officers for no valid reasons than abused stabbed with needles and tortured under judith chapmans SS squad. So the police wouldnt get sued for this unlawful detention they asked a doctor i never spoke to nor was she at the police station, she lied on my NHS records that I had some serious mental health episode on the day I was detained, the truth is that I didnt and despite seeing psychologist there after and being diagnosed with acute stress. The doctors have refused to delete that fabricated lie so I cant sue the police nor social services in leeds for the horrific abuse they put me through. That lie has kept me in the system even though Im not supposed to be and the leeds ambulance have been asked by the police to harass me for four years about that incidence going as far as traumatising me daily at our home with sirens showing up in town harassing me. We wrote to Jeremy Hunt the head of NHS about how police in leeds are able to manipulate medical staff to cover up police misconduct patient profiling.That NHS lie on my records has ruined my careers allowed some corrupt ss to show up at our home intimidating me because an advocate tried to help me find out who had lied on my medical records!Its left me in fear since the police can missuse this lie to discriminate and control me, coercive control and lying on medical records is illegal so why does the NHS make it so difficult for NHS patients to amend and delete bullocks writen by fraudulent doctors on their records even with the correct diagnoses on the records? in Wales they have a systrm called PATIENT KNOWS BEST this allowes patients to have things amended. How many corrupt police and ambulance crew get away detaining women harmning them and than lying on their records, how many people are locked up in england in a ward due to does lies!!!??? My GP surgery has shared private information with another organisation.I have full NHS opt-out confirmed in writing.What's more, the information was wrong and has caused me much distress and embarrassment.I cannot find a solicitor who deals with data breaches of this nature.I have started a complaint with the ICO but I have to wait 40 days first.What recourse through the law do I have? my previous heath visitor recorded unrelavsnt some intimation was mistook communication caused and how can I requirest for mend it , many thanks ! @Londoner - you would have to take it up with the surgery directly. There isn't really anything else you can do. I don't think you can make a claim. Hi, I would like some advice from anyone who reads this, my husband and I share the same surgery recently he was prescribed the same medicine as me unbeknown to me,because e works nights and because of the surgery times I have to call her early in the morning to get an appointment. So I called the surgery and asked for a appointment once the receptionist had taken all his info she said a phone call would be better, he hadn’t had a call back and asked me to chase it up twice, theydidn’t call, the receptionist even asked is for you. The next day I made a appointment for Home and complained to the receptionist the day before,so anyway my husband goes to his appointment and is accused by the doctor for giving me the medicine and discussed my medical history with him, if he had given me the medicine then I told wouldn’t want any advice but I feel dee Let let down? There my medical records what do I do next? my files have been shared without my consent what can or should i do? Is there any way that someone can find out if their name has been recorded in someone else's medical records. For example, someone has suffered an injury and goes to their GP and the GP asks how they incurred the injury to be told - Fred assaulted me. Is Fred entitled to any information recorded on the patient's file that mentions him by name? The DWP Child Maintenance Service asked me to justify my Ailment and reason for long term sickness. Can Companies demand legally you verbally divulge medical information? @cindy - I don't think they're going to read 'all' your records - they don't have time between patients. It's up to you to fill in the details - I imagine the doc just gives your records a quick glance. Sorry if we're going over old ground here; I have been with the same private opticians since the mid 70's. The owner recently sold the business and I have swapped to a new optician. I have requested a copy of my full history from the new owners of my original opticians. They have refused and said that they are not legally obliged to do this; all they are prepared to send me is a copy of my latest prescription. Is this the case? (surely not). They said that they could pass them on to my new optician. They also said that it would be meaningless to me as i am not medically trained (which is true but rather patronising). How do I get them to send me a copy of my records? @Lea - I don't think she can without permission. I have a friend who work's behind the desk at my surgery. Can she look through my medical history? As it is confidential and even though she is my friend I wouldn't like to think she can look through my files. @judo - I think if the court orders it in a child access case then social services can hand information to the courts. Don't know if that is relevant or helps you at all.